First Year Tips: Academic Advising! With that being said, we want to provide our future classmates with as much help as we can before they arrive on campus! This blog post will begin a series of posts that highlight some awesome resources in and around campus. If there’s something you want to hear more about, leave us a comment or DM us on one of our social media accounts! This information, along with more explicit details, can be found on their super helpful website! The following sections will point out a number of ways that advising has helped me–and how they can help you too! At this point, the vast majority of our future Tar Heels have already made it through Orientation, so you’ve got a decent understanding of how registration works. If this process still baffles you, your advisor can show you exactly how it works! In the future, advising can help you decide what classes you should register for, to ensure that you graduate on time, but also that you’re not overwhelming yourself with too rigorous of a schedule! Some of you may be undecided on your major, and that is totally okay! Your first year is a great way to explore different majors and minors, while fulfilling some courses for your gen-ed requirements. I was completely undecided on a major until recently, so my advisor provided me with a career interest survey, where I answered a TON of questions, then got some feedback about what careers & majors might suit me best! Once you get to know your advisor, they always have your best interest in mind! I have met with my advisor several times throughout the year; he knows what my career goals are, so he’ll often point out different internships or other opportunities in the area that I could take advantage of. Advising is your friend! You’re required to meet with an academic advisor in the fall of your first semester, but don’t think of it as an obligation. Get to know your advisor, schedule many appointments, and take advantage of this awesome resource! Their job is to make sure that you are totally satisfied with your time at UNC, so check out their office. Advising can be found in the Steele Building or the Hardin Hub on South Campus. Good luck, Tar Heels! So your parents are coming to visit this weekend and you have no idea what you’re going to do with them. Don’t worry, while I’m technically a 21-year-old college student, at heart, I’m more like a 45-year-old father of three, so I’ll know exactly what your parents will enjoy when they come to visit.UNC offers a variety of parent-friendly activities that will fill your weekend itinerary and distract from the looming conversation about your GPA. Check out some of these great options, and get to planning! Wilson Library is one of my favorite places on campus, not only because it’s a beautiful, iconic building, but also because I’m a huge history nerd and they have great exhibits there. Some of my favorites were the “Sounds of ’68” exhibit, the exhibit on the Daily Tar Heel and the student-curated exhibit on Mary Shelley’s Frankenstein. All of the exhibits are very well-done and interesting, and it’s a great way to learn more about North Carolina history. I firmly believe the Carolina Basketball Museum is one of the coolest things on campus. 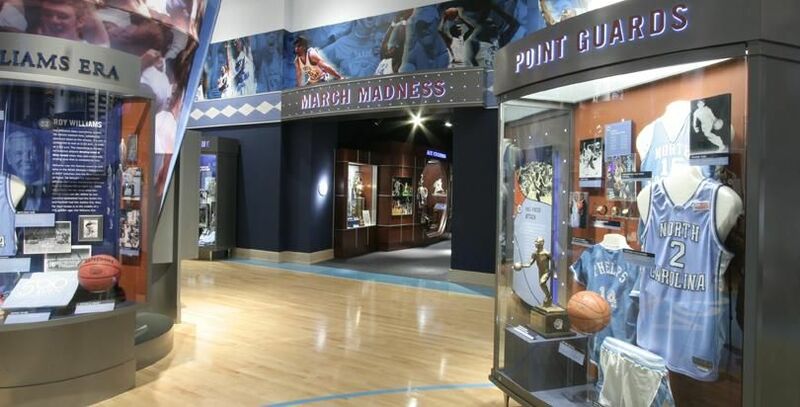 It’s located on the first floor of the Ernie Williamson Athletics Center next to the Dean Dome and the Koury Natatorium and includes every ball from a UNC national championship (except for the one from 1924), championship rings, uniforms of some of UNC’s most famous stars, the original floor of Carmichael Arena (the one Michael Jordan played on) and more. For anyone who loves sports and/or Carolina Basketball as much as I do, it’s amazing and a must-see when you come to Chapel Hill. I love space. I actually wanted to be an astronaut when I was younger, but then I realized that required both math and physical activity, neither of which I’m very fond of. That being said, I still love learning about space, and therefore I love Morehead Planetarium. 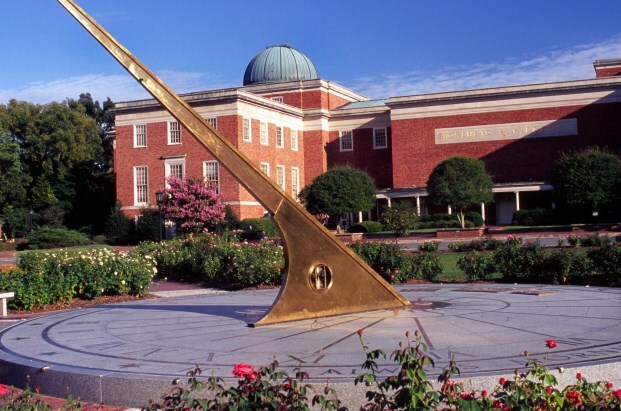 Morehead Planetarium is a huge building on Franklin Street on the east side of campus that has planetarium shows where visitors can learn about the final frontier. Fun fact: 11 of the 12 astronauts who walked on the moon explored space in one of Morehead’s shows, so if you go to one, you’re basically an astronaut. Jokes aside, I definitely recommend checking this place out. Ackland is located on South Columbia Street near Franklin and boasts a personal collection of nearly 18,000 works of art. Works being featured range from European masterworks to the pieces from the premier Asian Art collection in North Carolina to contemporary pieces. There’s tons of beautiful art in these well-curated exhibits, and if you take your parents here, they’ll think you’re becoming cultured. It’s a win-win. Carolina is full of personality to say the least. With that, there are tons of notable figures on campus that our students both worship and love to hate. We love our super successful alumni, but this one is for all the current Heels… Here’s the ultimate breakdown of all the current UNC celebs! Of course, the first celebrity I had to mention is our beloved chancellor – Carol Folt. Always dressed to the nines (probably in some form of Carolina blue), Carol is the true QUEEN of UNC. She loves our school and it’s students, and can be found supporting them at various events throughout the year, so stay alert because you never know where you’ll see her! 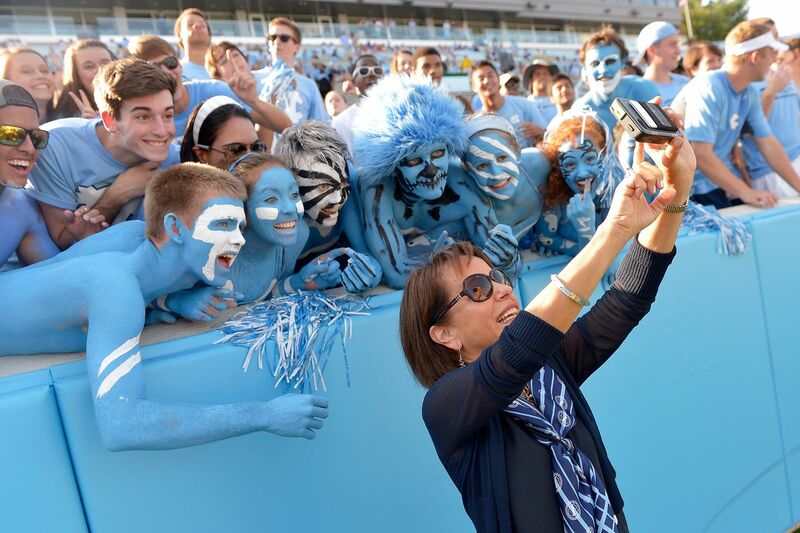 Also, if you see her – you HAVE to ask for a selfie, she loves taking them, and it’s #81 on UNC’s bucket list! Easily my fav celeb on this list is THE Roy Williams. He’s only the coach of the greatest college basketball program of all time (Bias? Maybe a little, but that doesn’t make it not true…). Let’s just take a minute to acknowledge this man’s coaching accomplishments. I have nothing else to say other than this Roy is an angel in human form and we LOVE him! Along those same lines, any player on the UNC basketball team is regarded as a celebrity on campus. They walk around like skyscrapers in a crowd, which makes them pretty easy to spot. I’m sure when they walk around campus they constantly hear “omg, there’s Luke Maye/Kenny Williams/Cam Johnson/etc.”, but that doesn’t mean you shouldn’t alert whoever you’re walking with – it’s the friendly thing to do, right? 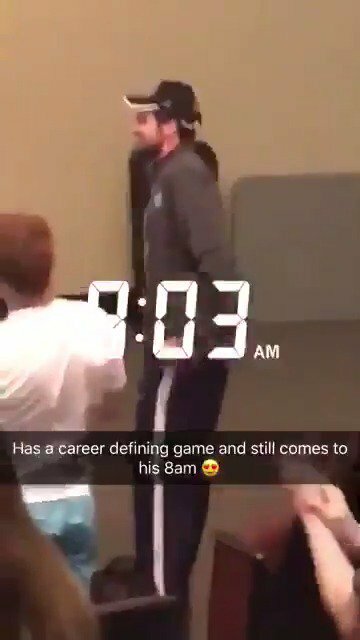 After Luke Maye saved the day keeping us alive in the 2017 Elite Eight game vs Kentucky, he showed up bright and early to his BUSI 101 8am lecture! Gary is a man that sits in the pit or the corner of the Quad and screams very radical religious statements at innocent passerby’s. Regardless of your religious beliefs, its very amusing to sit and listen to his claims and watch people’s reactions. Gary has become such a part of UNC culture that students have dressed up as him for Halloween! 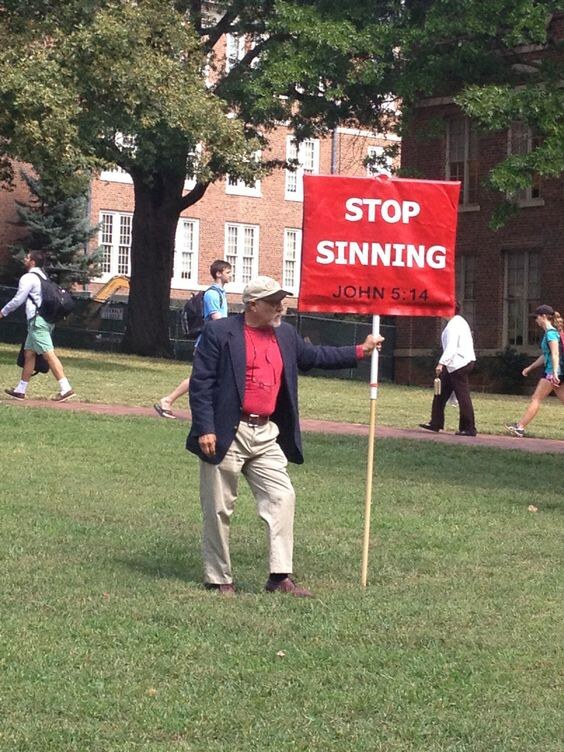 Rumor has it that Gary has retired/is retiring soon, and many new pit preachers are surfacing to fill his shoes. But no one will ever replace Gary the original. I’m not really sure if this counts as a notable figure since most wouldn’t recognize him in person, but one thing is for sure – we’ve all heard that whistle. He strolls through McCorkle Place so often that you may think there’s an automated whistling sound track running over some loud speakers in the quad. The face behind the voice, courtesy of DTH! As you cross the streets of UNC, you’ll often be greeted by traffic guards making sure you make it safely to the other side. Joann is one of these people, but she’s incredibly special to the Carolina community. She will always respond to your “thank you”, and always has a smile on her face – through rain or shine. Students are such a big fan of this hero that a GoFundMe page was started to fund Joann’s travels to Arizona to visit her son. This fundraiser raised over $7700 – 11 times it’s original goal of $700! Joann receiving her funds, photo courtesy of DTH. It seems fitting to end with another beloved, but less-known UNC hero. Before November of 2017, Dan Reichart was just a Physics and Astronomy Professor. 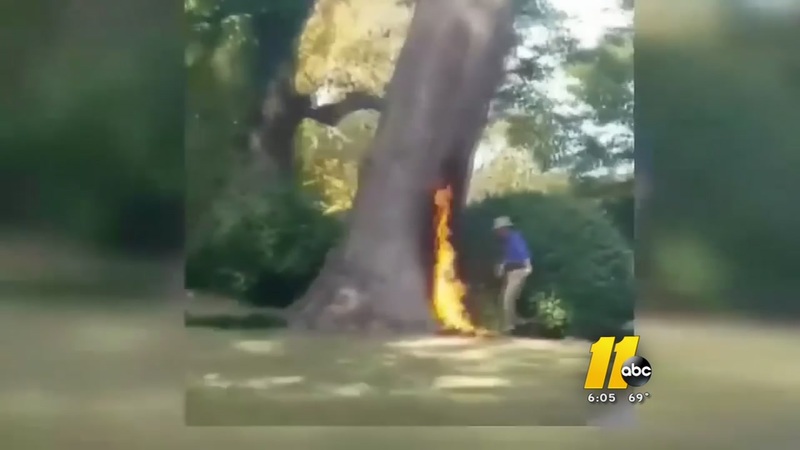 But when there was an attempted bombing of the Davie Poplar tree, Reichart literally jumped in the fire to save the day. Surviving with second degree burns, the fire exploded on the professor as he was trying to extinguish it. We’re so thankful for Reichart’s actions in saving the momentous Carolina tree! You asked, we answered! This blog goes out, specifically, to Komal. You wanted tips on how to make it through your first day at Carolina, and we’ve got answers for you. Follow these and you’ll have an FDOC better than the one in Ned’s Declassified. How do you spot a first-year? They don’t know the Carolina lingo. Don’t be that kid. Every year, the DTH sends out a first-year guide to all things UNC. In it? All the Carolina abbreviations. I’ll highlight some of the basics for you. First of all, the DTH is the Daily Tar Heel. It’s our on-campus newspaper that’s totally student-run (make sure to sign up for it if you believe in the future of journalism)! They publish new stories every day, from sports coverage to social activism. Make sure to check your mail over the summer for your special copy and read up on all the acronyms. Once you get to Carolina, you’ll be hearing a lot of FDOC. FDOC stands for the First Day of Class. Towards the end of the semester, you’ll hear this replaced with LDOC (Last Day of Class). All of your friends will ask you how your FDOC went, so don’t be caught off guard! It’s also a tradition to drink from the Old Well on FDOC. They say you get a 4.0 for the semester if you do. I’m not one to brag, but from experience, I know it does have a small success rate. Some people like to line up at the well right at midnight and sing the alma mater with other Tar Heels. You definitely don’t need to be that dedicated to the cause to get a 4.0, but definitely stop by at some point during the day. It’ll be hot and the line will be long, but you never know who you’ll meet while you’re waiting. Nothing is worse than being late for your class because you went into the wrong building. Make sure to take time the day before FDOC to find all your classrooms. Go with one of your suitemates and do a run through of what your days will look like. Make sure to do a Mon/Wed/Fri mockup and then a Tues/Thurs. Also, big PSA, there’s a difference between Hanes Hall and Hanes Art Center. If you have one of these on your schedule, make sure to check you’re at the right one. They’re not across campus or anything, but it’ll still take you about five minutes to walk between each. Trust me, if you have an 8 am, you do NOT want to waste an extra five minutes. UNC is a big campus. 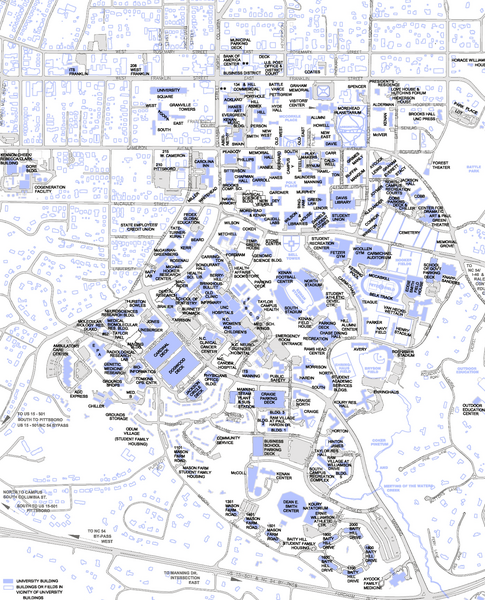 I spent my first few weeks with a map of campus as my phone background. Don’t be ashamed if you have to do this. It’s way better than being lost. I’ve only had one 300 person lecture class during my time at UNC and I can honestly say I’m BLESSED. Those classes aren’t fun. Mine was ECON 101 (again, not fun). A lot of 101 courses, especially science ones, will be big lecture ones. Though recitations make them feel a little smaller, the class itself can be easy to get lost in. My best advice is to sit in the front. In my econ class, I sat in the very front row. That might be a little extra, but definitely try to find a seat up front. I’m not saying it’s true, but in my opinion, a lot of the students who get those higher grades will sit in the front. Maybe correlation, not causation? Also, a lot of these lectures require group work to answer poll questions, so you want to be surrounded by smart kids. There’s a good chance if you sit in the back you’ll be stuck next to a kid who only shows up to class the first day, exam days, and last day. And when you have 45 seconds left to answer a poll (yes, @Balaban), you’ll regret not sitting next to someone else. Nothing is worse than sitting in a quiet classroom and then your stomach starts growling. Trust me, this happened to me all the time if I skipped meals, and though it’s funny the first few times, I could tell the people sitting next to me would get annoyed after a while. Get into the routine of making time for lunch every day, starting with FDOC. This is an easy way to squeeze in social time during your busy day. I was scared of eating alone at first, so I always went with a friend. After a while you realize eating alone is totally normal, and sometimes needed on bad days, but those first few weeks it’s nice to use the time to get to know the people you’ll be seeing for the next four years! Also, make note that your Monday schedule isn’t that same as your Thursday one, so switch up your lunch routine! You don’t have to eat in the dining hall every day. If you’re extra busy during midterm season, use a plus swipe and take your food to go to a library. Ugh, professors who do this are the worst. My first day at Carolina I was SO unprepared for this question. UNC is great because there are so many cool people who attend. But that also means those cool people have REALLY cool fun facts. I’ve had all but one professor at Carolina ask me for a fun fact, so chances are your professors will too. Don’t be that lame kid that says you played baseball in high school. Newsflash: this sounds like you peaked in high school. Think back to the unique moments you’ve had in your life, and share one! But please don’t go into a full story either, it’s a fun fact, not a fun novel. Create group chats with the people you sit next to in class. This is an easy way to get to know your classmates, and it’ll come in handy when you need help with homework. Carolina students are really friendly, I promise you no one will think it’s weird if you take initiative. My MEJO 101 class I sat next to my roommate. On our first day, she made a group chat with the two boys who sat behind us. We didn’t know it then, but by the end of the semester, we all became besties! Also, divide and conquer is an actual thing. It’s easier to find the answers to a study guide between four people than by yourself. Do yourself a favor and create that group message. Well, there you have it, how to survive FDOC, Carolina edition. Stay tuned later in the semester for how to survive LDOC. That one is a lot more fun :). Being a student at UNC comes with a lot of responsibility, history and traditions. We’re a tight community, all linked by this same passion for our university. With that, we have some special ways of expressing ourselves. Here’s a beginner’s guide to some essential Tar Heel lingo (that you may already know) to make yourself sound like a seasoned upperclassman when you step on campus! 23 – The number that Michael Jordan, noted UNC alum and arguably the best basketball player of all time, sported while winning the 1982 National Championship. Also the number that many of us sport from the sidelines of almost any Carolina activity. 89 – The year that the first (and totally unbiasedly greatest) public university in America was founded, 1789. Another number often seen on jerseys to commemorate a historic occasion. Born and Bred – A phrase from UNC’s alma mater (Hark the Sound!!! ), sung at the end of each sporting event. Summarizes our community in that we were all destined to be Tar Heels from day one (even if you weren’t raised this way, you’ll feel like you were!!). Ceiling is the Roof – Honestly one of the most insightful and inspirational quotes from our very own, Michael Jordan, while announcing his partnership with UNC’s football team. It’s important to note that this was during the 2017 dook game (which we won) – the last home game before winning the natty… don’t question the logic. DTH – UNC’s student run newspaper organization, the Daily Tar Heel. Captures iconic campus events such as previously mentioned 2017 natty – you may have to get aggressive to get a copy of the Redemption issue though, they’re highly sought after. Dook – Let’s all learn how to spell our opposites’ name correctly! Producing villains such as Grayson Allen, the only way to spell this university is our way. After all, we’re the better blue and that’s a fact! FDOC – The first day of class, in which Heels line up at the Old Well and swear that this semester the sip will lead them to a 4.0… Fact or fiction, it’s a Tar Heel tradition we will always participate in with high hopes for an academically stellar semester. FTK – A motto you’ll probably hear a lot of on campus, as it comes from Carolina For The Kids, North Carolina’s largest student-run non-profit organization. Especially around Dance Marathon (their 24-hour no sitting, no sleeping event) recruitment season, you won’t be able to walk through campus without hearing “FTK, for the kids!”. GDTBATH – You’ll very quickly realize that every day is a “good day to be a Tar Heel”, so good that we needed an acronym – because that’s a long phrase to be saying that often. Win or lose, this acronym drives our rivals crazy (haters gonna hate), which makes us love it even more! GTHD – Speaking of the rivals, the ones we most love to hate are those gothic devils eight miles down the road… the dreaded dookies. The last unofficial line in our alma mater, and my personal favorite is the one that this acronym alludes to: go to heck dook!! LDOC – The beautiful cousin to FDOC, the last day of classes. A happy day of celebrating the long semester behind us and forget about the stress of upcoming finals. LDOC is especially fun in the Spring when students can lay out on the quad under a nice spring day and get tons of free swag and food in the pit, courtesy of CUAB! Rams Dining Hall – Now Chase Dining Hall, the older Tar Heels will always refer to the South Campus cafeteria as we know it: Rams. 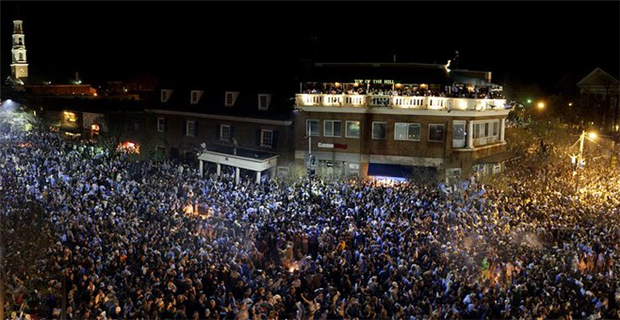 Rushing – After beating dook or winning a natty in basketball, students flood Franklin Street, burn couches in fires (and hop over said fires), and jump on each other’s shoulders. When the clock hits zero, students drop everything and sprint to Franklin and MLK from wherever they were watching the game. This is the ONLY way to celebrate the most important victories (I promise its super fun and will be a highlight of your year). Waterpocalypse – Another throwback that you may hear the older Heels talking about. In the Spring of 2017 UNC’s water was infected, cancelling classes that Friday afternoon and causing much of campus to evacuate. In a funny way, this brought students together as we struggled to relocate or survive waterless for the weekend. If I missed your fav UNC term, leave it & it’s definition in the comments!! As always, it’s a GDTBATH and GTHD!! Okay it’s true, Tar Heels love their basketball. No, we worship our basketball. From late November to early April, the one thing getting us through our Winter blues is that Carolina plays in the upcoming future. We plan our schedules around the Heels, ensuring that we are free to watch each and every game. That is all incredibly true. But we will never be just a basketball school. The passion for the color on our backs bleeds into each and every sport. Need some facts to back it up? Look no further. A classic example of Carolina talent in it’s purest form, this team holds a whopping 22 National Championship titles. For comparison, the next university with the most titles in this sport is Notre Dame with three titles. To say that Carolina is dominant in Women’s Soccer is an understatement. It should come as no surprise that several Tar Heel alums have won Olympic Gold Medals in this sport. We are so proud to call this program, led by Anson Dorrance, our own. Coming in third in the natty count behind Women’s Soccer and Men’s Basketball is Field Hockey with six championship titles! Most recently, the Heels made it all the way to the Final Four in 2017. This team was also home to six women who earned All-ACC Academic honors, proving that they are successful both on and off the field! UNC has won 20 out of the 35 ACC Field Hockey tournaments that have been played. That is, while the team accounts for 12.5% of the league, it owns ~57% of the tournament titles. In the 2016 Olympic Games, five out of the 16 players on Team USA were former Tar Heels. In 2016, UNC secured their fifth National Championship title in Men’s Lacrosse. The team also holds 13 ACC champions, the second most in the league behind Virginia. Next Thursday, June 28th you can catch four of these former Heels in action in the Major League Lacrosse All-Stars match! While our baseball team has never won a College World Series, this is such a talented team worth noting. This year the team made it all the way to the CWS, and while they weren’t able to bring home the title, we are still so proud of their incredible season! This team has six ACC tournament titles and 11 regular season titles, most recently in 2018. Another reason to love the Diamond Heels? Keenan Stadium and the Dean Dome are amazing places, but there is nothing better than spending a day in the Boshamer Stadium, watching the Heels play baseball, under a beautiful Carolina blue sky! So we’ve had our ups and downs with the football program here. While every season may not have been as picture perfect as we may have hoped, this program has created some remarkable successes worth noting. Greg Ellis, Julius Peppers and Mitch Trubisky are among the 215 Tar Heels that have played in the NFL. Cross Country, Track and Field, Fencing, Golf, Tennis, Wrestling, Gymnastics, Rowing, Softball, Swimming and Diving, Volleyball, Men’s Soccer, Women’s Basketball, and Women’s Lacrosse – I didn’t forget about you guys. But if I raved about each and every Carolina team (which I promise, I totally could), this blog post would go on FOREVER. So moral of the story, while our basketball team is home to seven National Championships, an incredible coach with over 800 career wins, and amazingly talented athletes; at UNC we love all our sports just the same – and we will not stand to be called a ‘basketball school’.